‘Cowboys & Aliens’ from the very talented Jon Favreau merges two of my favorite genres, Science Fiction, and Westerns – but does it succeed? Based on a graphic novel by Scott Mitchell Rosenberg, the film opens in the fashion of most typical westerns, a character shrouded in mystery rolls into town. Our stranger is played by Daniel Craig. He wakes up in the middle of the desert, a strange metal object attached at his wrist. We learn quickly that he’s a wanted man, by the law, as well as an influential land owner/cattle man by the name of Colonel Dolarhyde (Harrison Ford). The aliens are revealed as a showdown is taking place between the law and Dolarhyde’s men. Alien ships swoop down, snatching up the townspeople. Following the attack, the town puts together a posse to set out and save their friends and family. The juxtaposition of alien lasers and late 1800s weaponry is amazing. How little affect the humans weapons have on the aliens is fantastic. The story has some interesting twists and turns, and the film has a great start, no doubt due to the talented writers behind the film. Where the story falls apart is in its third act. Without giving anything away, there are a few twists and turns to get us to the finale, but the path in which we get there is riddled with plot holes. But despite these, the excellent casting and talent and of the actors in this film keeps us engaged. There is a good mix of puppet work vs CG, but my one gripe with the film is one specific action sequence that involves one of the characters jumping onto the aliens ships. There was something about the effect that definitely took me out of the film. The film was definitely a good western, but I don’t think it went far enough in staying close to that genre. There is something tragic about many westerns, and ‘Cowboys & Aliens’ was missing that sense of tragedy. Don’t get me wrong, it has its tragedy, but, it definitely felt restrained. 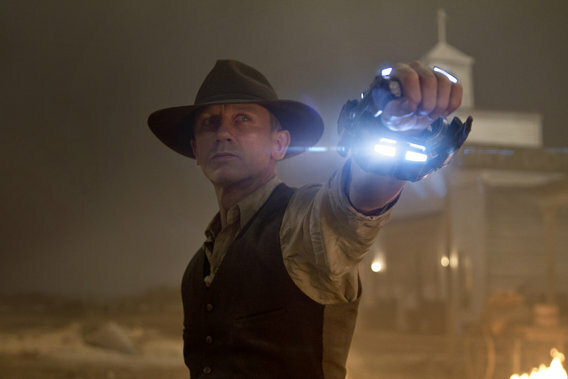 Despite it lacking in some crucial moments, ‘Cowboys & Aliens,’ is an excellent film. Daniel Craig’s performance, coupled with some genuine great moments with a supporting Harrison Ford make this film absolutely worth seeing in theater.